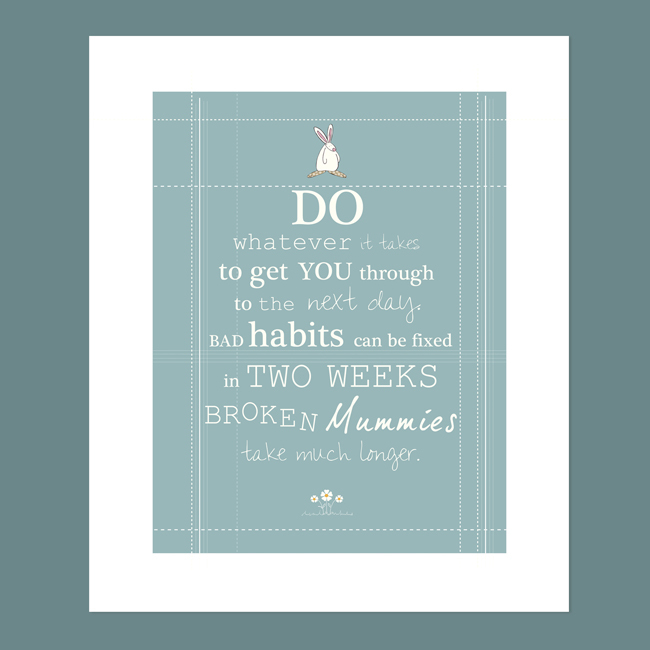 Broken Habits Art Print by Rufus Rabbit. Art for Mummies who need a smile. Do whatever it takes to get you through the next day. Bad habits can be broken in two weeks. Broken mummies take much longer. Rufus Rabbit loves to create affordable and original art prints. A print for those who could do with a smile reminder when they feel really up against it. This Broken Habits art print is perfect for sending to someone in need. Or you could pin it to the fridge or the back of the toilet door. Simply frame and place it somewhere inspirationally prominent! Printed on a quality textured paper, this art print will arrive with you backed on a sturdy board, in a cello wrapped bag. Whilst you are here, please do feel free to enjoy Rufus’ funny bunny blogs Motherhood? It does get easier, honestly!